It’s important to know how to care for your cattle well before you purchase your first herd. Raising cattle requires that you take care of cows, steers, calves, and bulls. Before the animals arrive on your land, create a series of paddocks and shelters suitable for your herd size. Then, start caring for the cattle directly by providing for their food, water, and health needs. For additional guidance and help, it’s always a good idea to work with an experienced livestock veterinarian. Provide at least 2 acres per animal for year-round pasture grazing. 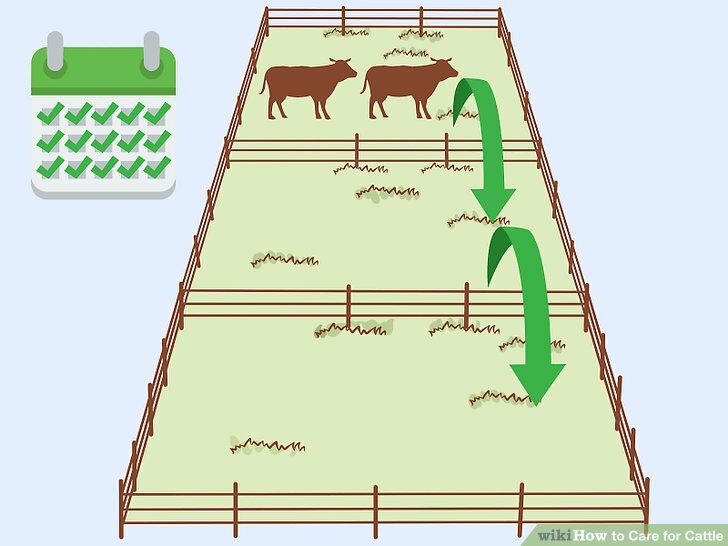 This is a general estimate of the minimum amount of space needed if you plan to let your cattle rely primarily on field roughage (grass) for food all year round. This estimate takes into account the fact that grass production slows in the winter months. More space is even better since it gives you a safety net in the event of any grass problems or drought. Give your cattle feed if you have less than 2 acres of land per animal. 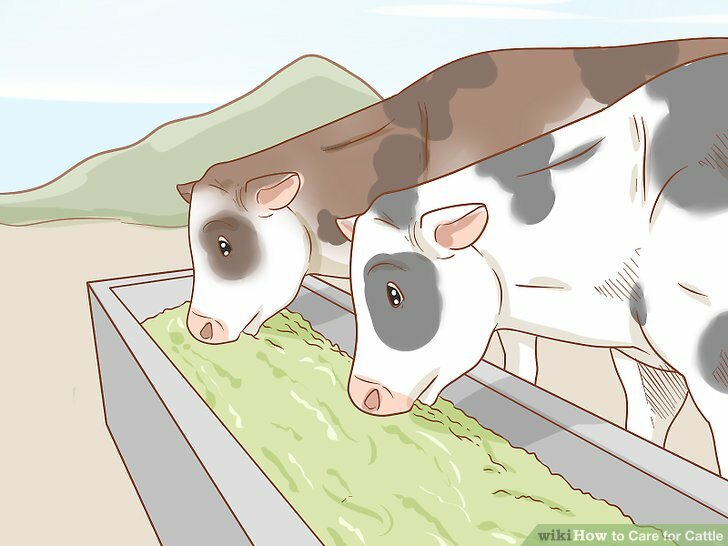 If you are working with a small farm space, it simply means that you’ll need to provide food supplementation in the form of cattle feed. Talk with your livestock vet about exactly how much grain your herd will require throughout the year, as it will vary by season. You can buy cattle feed at your local feed store or even online via bulk suppliers. Cattle feed is usually a blend of grains, such as barley or wheat. Determine how many paddocks you will need. There is no exact formula to figure out how to size paddocks or how to divide cattle into them. Take inventory of the animals that you own and think about natural divisions, such as keeping cows/calves separate from bulls. You’ll also want to balance out your herd, so that it will be easier to rotate between paddocks. As a general rule, the smaller your paddocks are, the more often you’ll need to rotate your cattle to keep them from depleting the area’s resources. Design the paddocks according to the contours and resources of your land. Once you know the rough size and number of your paddocks, look at an overhead map of your land. Separate your land into square-shaped paddocks with alleys in between them. When mapping everything out, try to divide up natural water features. Also, consider the location of any watering holes or stations. Ideally, you want your animals to avoid trekking up and down rough or uneven terrain to get to water. Segmenting shaded spaces into separate paddocks can also help minimize grass damage. As cows gather in shaded areas they tend to ruin the surrounding grass, so it’s best to isolate this activity to keep your grass healthy. Make the paddocks out of temporary fencing initially. Because there is always a bit of guesswork involved in paddock design, installing temporary polywire or polytape fencing lets you make adjustments as necessary without a major hassle. 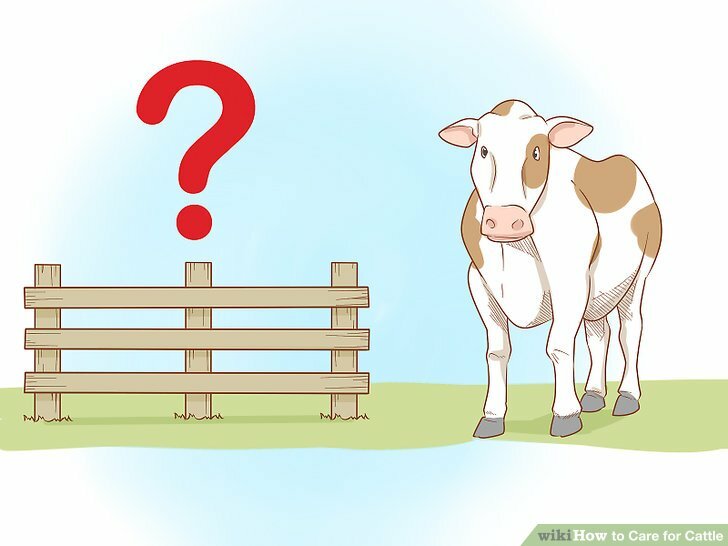 Use fiberglass or industrial plastic posts and attach the poly fencing in between at the height of a cow’s head. Electrifying the fence can provide an added level of security, too. Your alleys should be somewhere between wide. This makes it easier to mow or move machinery in between paddocks. Placing a fine layer of gravel on your alleys will keep them from getting too muddy. 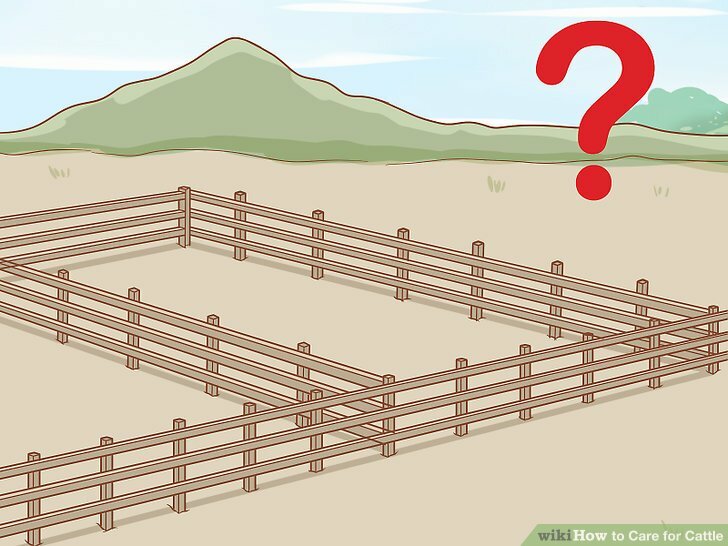 Place your gates in the corners and design them with the rotation of animals between paddocks in mind. Make the transition to permanent fencing by using a rail and board or steel post design. If you plan to plant fresh grass in your paddock, do so at least 6 weeks before introducing your cattle. Kentucky bluegrass, alfalfa, orchard grass, and white clover are all good sources of nutrients for cattle. Rotate your cattle between the paddocks daily. If you place your entire herd into a single paddock, they will eat away at the grasses and ruin the space. Instead, move your herd once or twice a day to different paddock spaces. Round up your cattle, open the connecting gates between paddocks, and drive your cattle into the new paddock space. For example, you’ll need to protect paddocks with less productive grasses, such as Kentucky bluegrass. You may need to rotate your cattle out of this space more frequently. Adjust how frequently you rotate your cattle according to the specific season. In the spring and summer, you’ll need to move them more frequently to keep up with the grass growth. 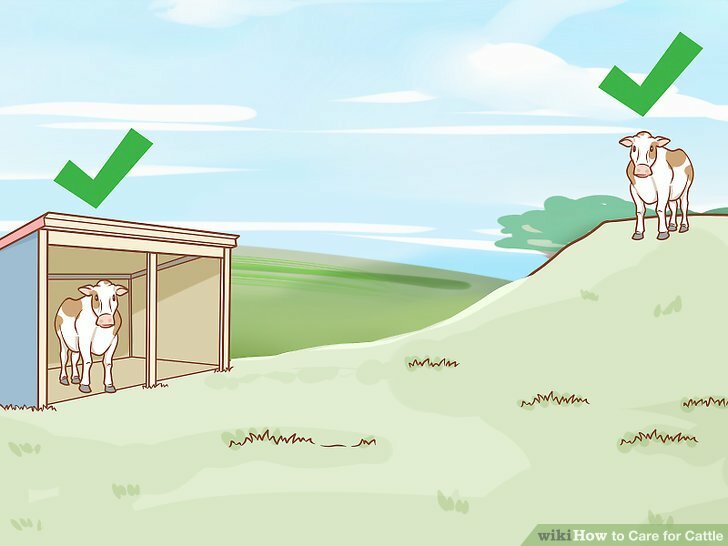 Ensure that your cattle have access to either high ground or shelter. If extreme weather hits, you need to be able to move your cattle to a paddock with high ground, so that they can ride out the rain or flooding without injuries. Alternatively, you can build a barn or fenced in area with roof coverage for your cattle, but this is a luxury that many cattle owners do not create. If you choose to keep your cattle in a contained area, muck out the manure regularly to avoid the spread of diseases. Check that the flooring of any housing is slip-resistant. This will reduce the possibility of injury to the animals, especially in wet conditions. Supply fresh water for your cattle. If a stream or river runs through a paddock space, it can provide a source of water for your cattle. You can construct an access ramp, so that cows can access the water easier without polluting it. Or, you can use a siphon system to fill up water tanks from this source. 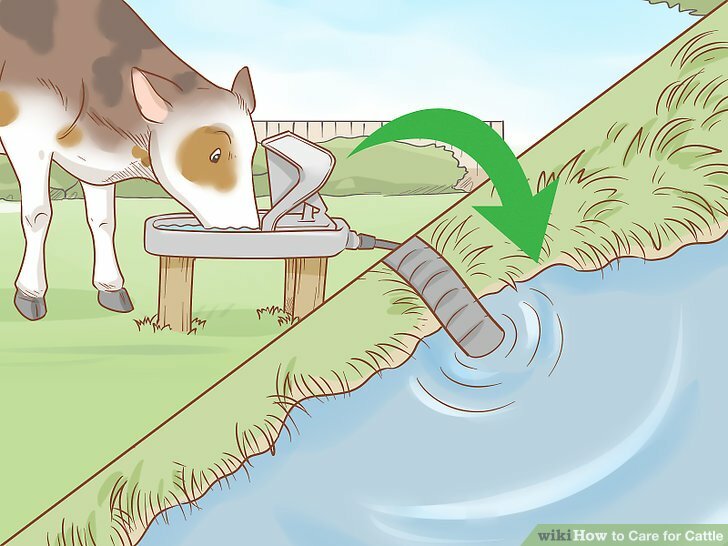 Another alternative is to install an animal-operated pasture pump. This is a water pump that is triggered by a cow’s nose pressing against the lever in the water tank. Then, the water is automatically siphoned up from the river to fill the tank. If you are using a freshwater spring or river as a water source, it’s important to clean it out periodically to ensure that it doesn’t become contaminated and spread disease. As a general rule, cattle need daily access to between 1-2 gallons of fresh water per 100 pounds of body weight. This means that you’ll want at least 1 tank per paddock that can hold the minimal amount of daily water for the animals in that space. Supplement their diet with feed. Pastured cattle can survive by primarily eating grass. However, if your cattle are primarily in a dry-lot or if the weather is poor, then supplementing with grain or hay is a good idea. Talk with your vet about which grain or hay to use and how much to feed your cattle. Use a hay rack or clean feed container in a paddock or barn to give your cattle hay or grain. Wet, moldy food can actually sicken your animals. If the hay or grain gets wet, discard it immediately. Feeding your cattle grain helps you to form a positive relationship with them, too. They’ll associate you with food and are more likely to come to your calls. Provide a source of salt. Cattle can’t store salt in their system, which means that they need to ingest it daily for health. 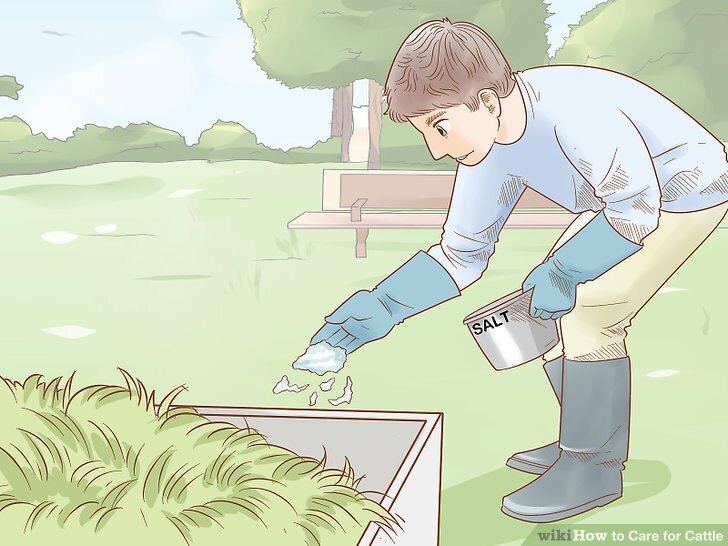 Fill up a feeder with a fortified trace mineral salt mixture and place it near where your cattle sleep at night whether in a paddock or barn. In addition, place at least 1 rock salt and mineral-blend block in each paddock. You can purchase these salt products at your local feed store or even online through an agricultural supply company. As a general rule, a 1,300-1,400 pound cow will need between 35-45 grams of salt per day. If you have 100 cows, then you’ll need about a 55 pound bag of mineral salt mixture each week. If your cows balk at the taste of the salt mixture, try stirring in some dried molasses to improve the flavor. Work with a livestock vet to monitor your herd’s health. 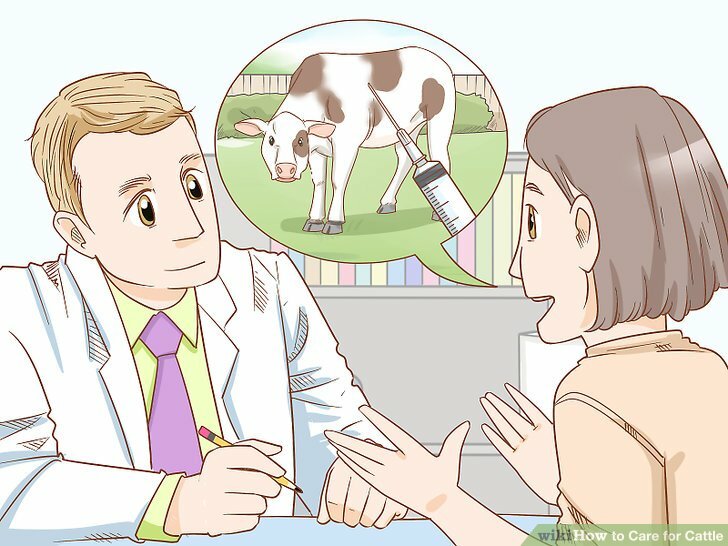 Your vet will be able to tell you which vaccinations are suggested for your cattle. Some shots you may be able to give on your own, but others will require a vet visit. It’s also important to monitor your dry-lot cattle especially closely, as they are more prone to illnesses, such as pneumonia. A dry-lot is a fenced area that is free from grass. Most cattle owners rotate their animals between dry-lots, grassed areas, and enclosures. Dry-lot cattle often suffer from respiratory illnesses caused by the dust in the air. Cattle vaccinations can help to protect your animals from diseases, such as blackleg or Bovine Viral Diarrhea (BVD). Monitor the health of your bulls closely during breeding season, as they can injure one another in the process of competition for breeding rights. Train your cattle to respond to particular sounds. 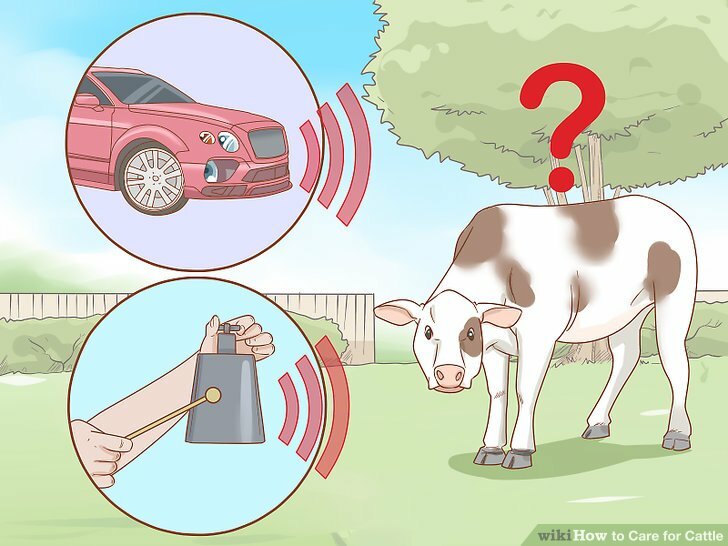 When you first see your cattle, honk your car horn in a certain pattern, ring a cow bell, or yell out a phrase or noise. You can also make these sounds when you feed your cattle, so that they’ll associate responding to you with food. Keep working at training until your cattle recognize your noise and respond to it. In some cases, your cattle will learn to respond to your call in around a week. However, it might take longer, depending on the animals and your training methods. The most effective training approach combines consistency with an immediate reward, such as hay. 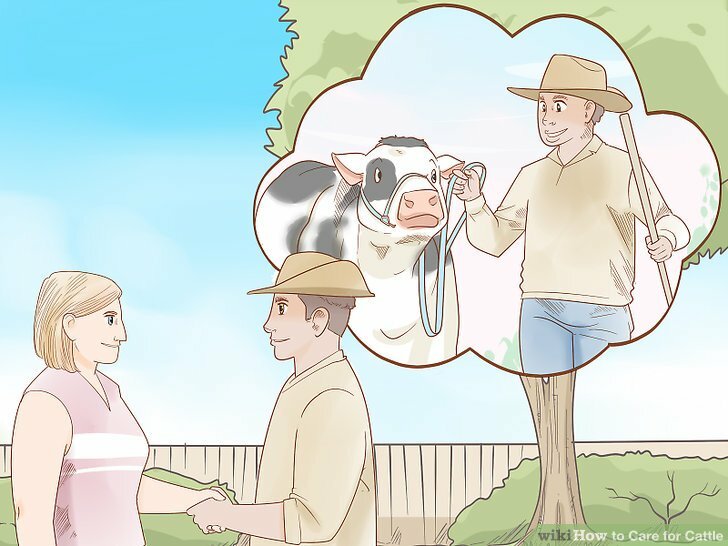 For example, if you arrive at the paddock at the same time every day, ring a bell, and then give your cows hay when they respond, they’ll associate listening to your bell with food. 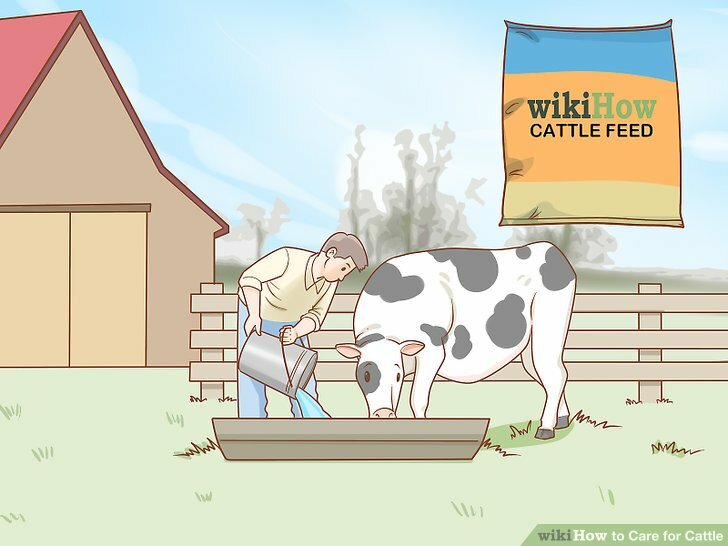 Treat your cattle gently and without violence. Using electric cattle prods can actually make your cattle behave recklessly. Similarly, whips can also scare your cattle and make them not trust you. 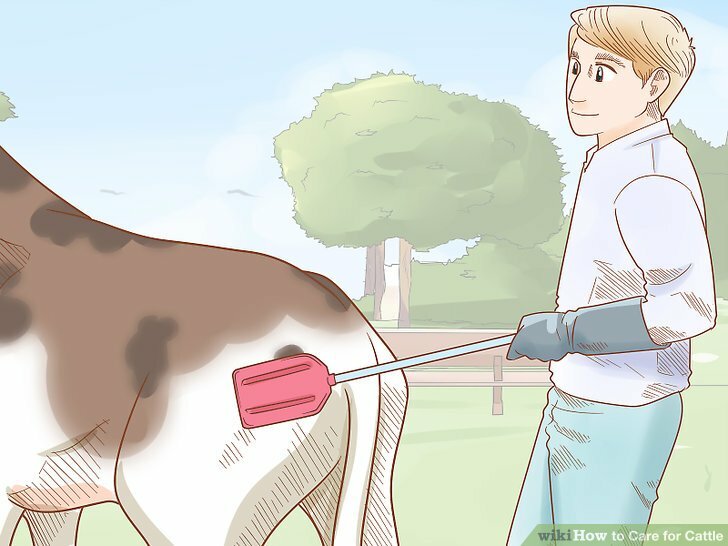 Instead, to encourage your cattle to move, apply gentle pressure with a plastic paddle or the sides of a broom. A paddle is often a good idea because it is a wider tool and cattle can more easily track it. If you move slowly and carefully, then this can minimize their fear. Also, if you grab your cattle’ tails, do so carefully to avoid injuring them. Pulling or twisting their tails can actually cause breakage. Keep your animals calm by pairing them up. Since cattle are herd animals, it can frighten them to be touched or moved around alone. When you need to treat or inspect an animal, separate it out with at least 2 others in tow. Similarly, if you notice a cow or bull becoming aggressive it could be because they are not comfortable in too small of a herd. 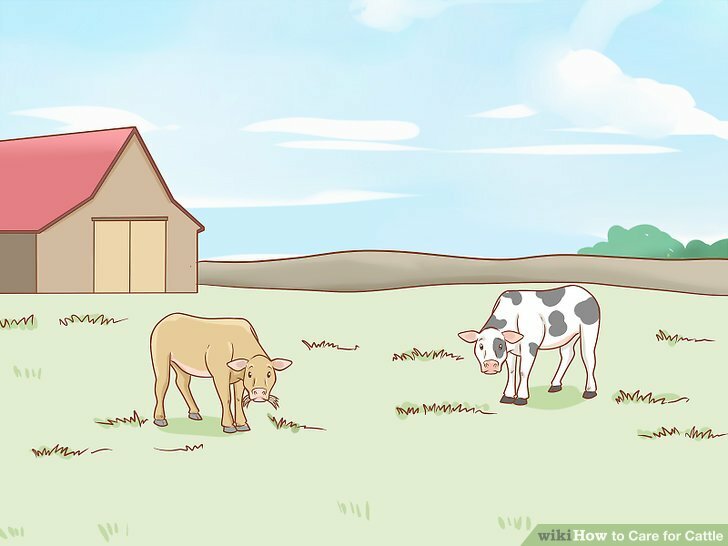 If you are working with younger animals or calves, bring in a few mature cows to keep them calm. Hire only experienced cattle handlers. If you have a number of cattle or just need extra help, then reach out to others in the agricultural community for possible job candidates. Look for people who have worked with cattle before and who are familiar with how to care for them properly. Once you hired someone, spend some time observing them in the field. Request that your employees continue their cattle-related education by taking agricultural classes at the local college or even by watching instructional videos online. 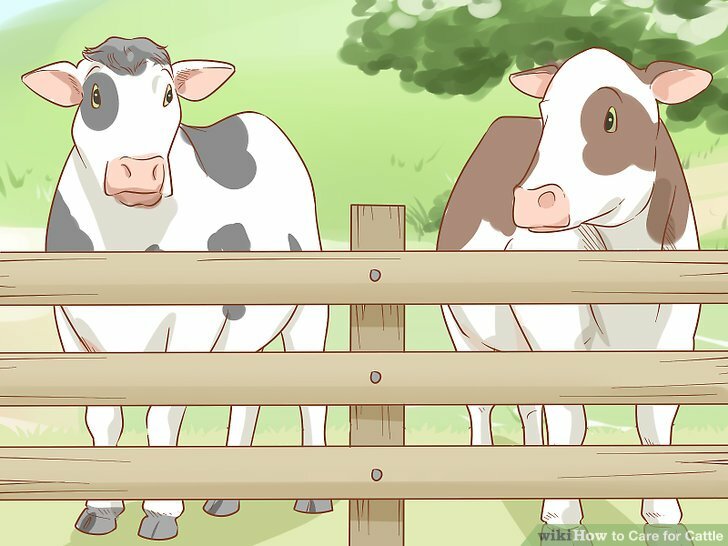 If you are new to cattle-raising, try starting small with just 1-2 animals. Find a mentor if you are new to cattle raising. Reach out to your local livestock veterinarians, dairymen, cattle breeders, or agricultural industry professionals. Owning a cow or steer is a long commitment, as some animals live upwards of 18 years. Make sure to carefully consider this before building your herd. 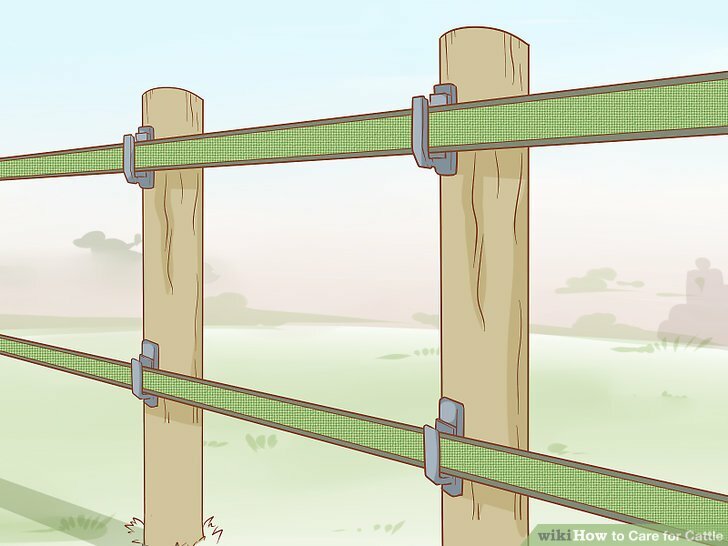 Monitor your fencing on a regular basis to ensure that there are no sharp points or breaks. Pointed areas can harm your animals and damaged fencing can contribute to escapes.